If you want to save time and money when quoting, selling, ordering, and purchasing products and services you need QuoteWerks. QuoteWerks is used by over 64,000 users worldwide in over 100 countries and enables companies in every industry to create detailed quotes with speed, accuracy, and efficiency. It pulls data from contact record fields, resulting in a printed (or online) quote. I’s’ a stand-alone product, and does not require word processors or spreadsheets (although, MS Word is an output option). It features include the ability to send and receive your quotes across the enterprise and supports 9 different ways to price your products and services. It enables on the fly, real-time vendor price comparisons. Create “bundles” or “kits.” QuoteWerks. 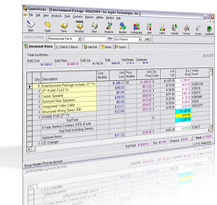 Define product or service configurations – products can be set up to have required, optional, and substitute items. Ask questions through the customized quote page (keeping all communication together). Electronically accept and sign the quote. QuoteValet is a more robust way to deliver quotes to your customers and prospects. You’ll know when your customer has received the quote. You will know when they have viewed the quote and how often they review the quote. They’ll can choose the line items and options they prefer, and your quote will be updated in your QuoteWerks system with the updated information. Generate detail reports on your product lines, inventory, etc. In today’s market quoting must be accurate, efficient, and fast; getting the quote into the customer’s hands quickly can mean the difference between winning – or not winning – the sale. On the verge is here to help with your QuoteWerks and contact management integration, providing everything from project planning to software sales through training and technical support. As a QuoteWerks Business Partner since 2004, On the verge can help your team implement QuoteWerks and exponentially increase your quoting productivity. Close more sales by simplifying and speeding up price quoting/estimating process in the office and on the road. Contact us here to receive a full-feature demo version of QuoteWerks. Or call 781-606-0433 and ask for the Chief Problem Solver.